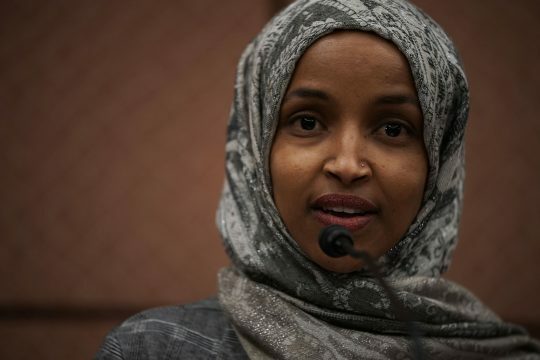 Commenting on anti-Semitic tweets she wrote earlier this month, Rep. Ilhan Omar (D., Minn.) said she did not apologize for being anti-Semitic during an interview with The Intercept released on Thursday. "You've since apologized unequivocally for the tweet. You've said rightly that anti-Semitism is real. But just to be clear, I mean we're a few weeks on now, what were you apologizing for? Was it a badly worded tweet that you were apologizing for? Or was it for being anti-Semitic, wittingly or unwittingly?" host Mehdi Hasan asked around the 12:45 mark of the audio at the link above. "Oh absolutely not," Omar responded. "I apologized for the way that my words made people feel. Oftentimes, you know, we are in places where someone will say something, and they might not know how it makes you feel and it's not acceptable, that once you express to them that this is hurtful, that you have felt attacked by their words, they should acknowledge how you feel, they should speak to that, they should apologize and figure out a way to remedy that situation." "That's why you apologized?" Hasan asked. "That's why I apologized," Omar said. "And is that why you deleted your tweets this week?" Hasan asked. "The chairwoman of the Republican Party is all over Twitter suggesting that was some sort of … bad faith move on your part." "I mean for a Republican who always makes a bad faith move to call someone out on that is laughable … The reason and the purpose of the apology was to make sure that the people who were hurt felt understood and heard, and leaving the tweets up no longer would be part of that," Omar said. Omar stirred controversy earlier this month for anti-Semitic tweets. The Minnesota Democrat quote-tweeted a tweet by liberal journalist Glenn Greenwald, who was criticizing House Minority Leader Kevin McCarthy (R., Calif.) for threatening punishment against Omar and Rep. Rashida Tlaib (D., Mich.), who is also anti-Israel. Her tweet said, "It's all about the Benjamins baby" with musical notes, referring to hundred dollar bills. The Forward opinion editor Batya Ungar-Sargon pressed Omar to explain who is "paying American politicians to be pro-Israel," prompting Omar to respond, "AIPAC!" Omar apologized "unequivocally" for the tweets, and said her "intention is never to offend my constituents or Jewish Americans as a whole." She also "reaffirm[ed] the problematic role of lobbyists in our politics, whether it be AIPAC, the NRA or the fossil fuel industry." Last month, Omar said she used "unfortunate" language in a 2012 tweet where she wrote Israel had committed "evil" acts and "hypnotized the world." She also supports the Boycott, Divestment, and Sanctions movement against Israel, which has links to Palestinian terrorist organizations.